Based on the remarkable true story, Secretariat chronicles the spectacular journey of the 1973 Triple Crown winner. 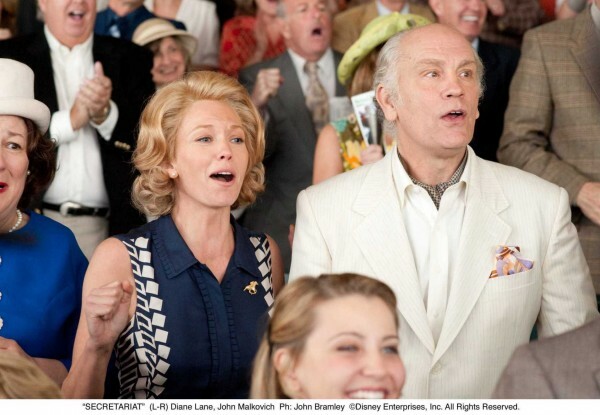 When housewife and mother Penny Chenery Tweedy (Diane Lane) agrees to take over her ailing father’s Virginia-based Meadow Stables, despite her lack of horse-racing experience, her life’s course changed in a way that she never could have imagined. With the help of veteran trainer Lucien Laurin (John Malkovich), Penny managed to navigate the male-dominated business and succeed against all odds with what may be the greatest racehorse of all time. In a press conference at the film’s press day, held at the Santa Anita Racetrack in Arcadia, Calif., co-stars Diane Lane and John Malkovich, along with director Randall Wallace, talked about bringing this incredible story to life and engaging the audience in a way that will have them cheering. Check out what they had to say after the jump. Randall, what inspired you to put the religious overtones in the film? RANDALL WALLACE: For thousands of years, the human race has spoken of horses in a way that referenced the magnificent mystery about them, and that quote from the Book of Job captured that. It had not been my intention through all of the drafts of the screenplay and all of the work that we’d done on the story to have that quote. It was when we were in the editing process, and my editor and I were looking. I wanted something that told us that that spirit of the horse was timeless and it was about transcendence. 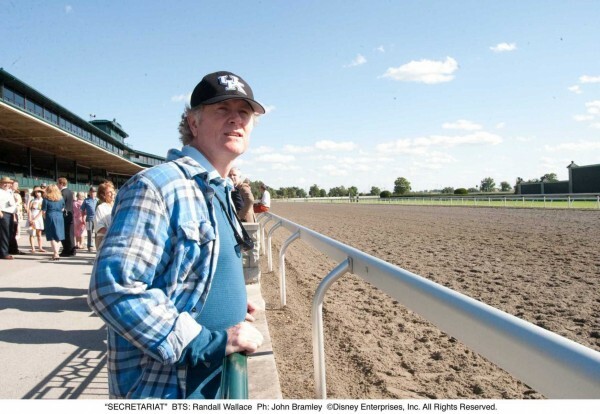 I thought that what Secretariat had done had transcended what anybody imagined was possible. That also meant that I wanted the music in the end to capture a spirit of joy and celebration. In all of my other films – Braveheart, We Were Soldiers, Man in the Iron Mask – along with courage and honor, there’s a sense of tragedy. This was a movie in which it is unalloyed joy. It glories in love and courage. And, “Oh, Happy Day” did that in a way that I thought cut through every culture, but reached every heart. 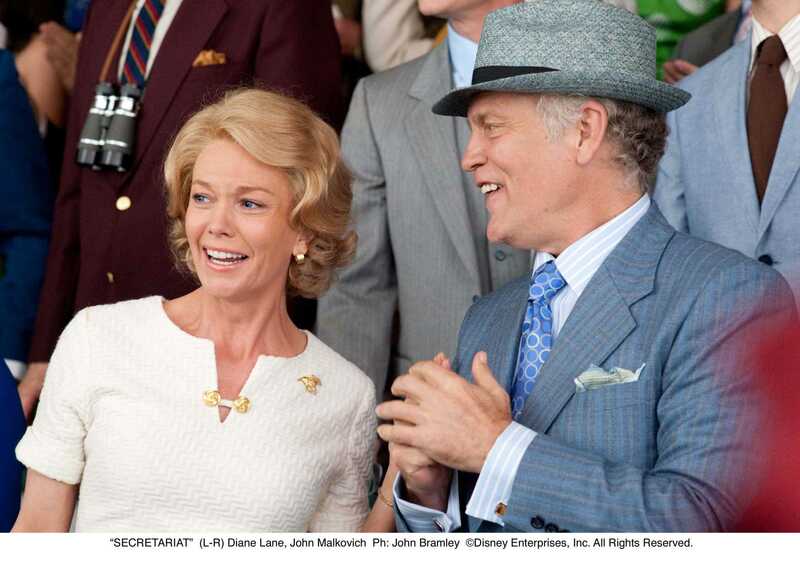 Diane, in talking to Penny Chenery and playing this character, what was it like to bring this woman to life in this time period? Diane and John, what were your biggest challenges in playing these roles? JOHN MALKOVICH: For me, the challenge is always the same, which is to try to do something well. I don’t often think of that challenge in terms of playing a specific role. I think about, “What is your part in this film? What can you bring to it that will help the film, as a whole?” I can’t say there was a specific challenge beyond what’s normally in movies, which is that you have very little time and almost no rehearsal. There just isn’t the time. That’s not how they make movies. LANE: I don’t really know that I can answer that because every film, to me, is unique. It’s its own planet, its own life and its own family. It’s a team sport when you’re in it, and then the infinite becomes finite and the film is done, and you see it with the music and the editing and all the parts that you weren’t there for when it was being filmed, and you really appreciate all the names that are scrolling by. You realize that you accomplished so much. I just feel very grateful and daunted by the prospect of living up to Penny’s legacy on screen, and it really is very gratifying to know that she’s happy with it. 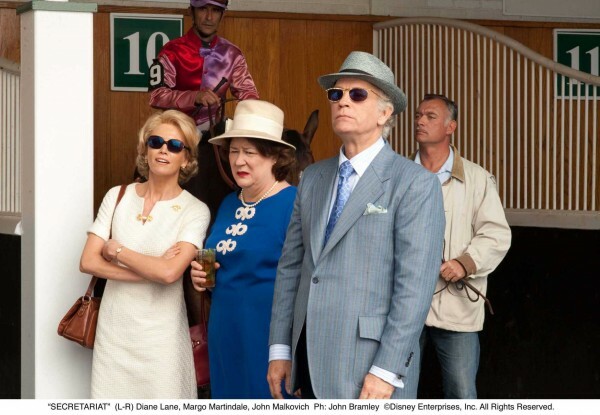 Diane, can you talk about the experience of watching the original videos of the horse races with Penny? LANE: Watching the original races in their original broadcast form with Penny on a VHS was a reminder of where we’re at in our history, to see all the commercials in between the broadcast. And then, to watch Penny watch it again, she was absolutely re-engaged. It just really sealed the deal for me that I better not screw this up. John, was there any film you could see of Lucien Laurin? MALKOVICH: There isn’t so much material available on video, or even written things, of Lucien. There’s some. He does make a very brief appearance on a very nice program that ESPN Sports Century did. But, Randall and I chose not to base it on his actual person very closely. We’re so different. He was a jockey before, so he was very diminutive and it wouldn’t have made a lot of sense for me to do that. Were you comfortable in those outfits? MALKOVICH: Yes. I would have thought 1973 was really the nadir of the history of fashion. When you just watch the races on YouTube, the astonishing ugliness of the clothes just blinds you. But, sure, I was comfortable. As actors, what do you think you each brought to your portrayal of your character? LANE: Selfishly and very personally, I love horses, as a species. It’s my totem animal. That’s a little corny to give away at a press conference, but there it is and that’s fine because it’s my truth. So, Secretariat was always the blend of mythology and reality that I didn’t understand as a child. It made perfect sense to me that a horse was finally on the cover of all the magazines. I took that personally, being eight years old. Everybody else was finally waking up and appreciating the great species that they are. I’ve learned a lot in this process. Aside from that childlike aspect, the similarity between my father and his wish for me, and Penny’s father and his wish for her, was a very sweet meeting spot of intention for me, on this particular film. MALKOVICH: Not particularly because it’s modest, but it’s hard for me to say what I brought to this film or any film. That’s up to the audience. I hope I communicated the love that I felt for that horse and for this story. If I didn’t communicate that, then I’m a failure. The other thing that I probably brought to it is that, unlike my grandfather and my older brother, I’ve actually been able to make some money at the racetrack. That has great meaning. WALLACE: I would like to add, in terms of what the actors achieved, that what we had in our cast was an absolute authenticity and a breadth of things to do. Diane’s character not only has to have her father die, she has to project courage in the face of loss and good humor to her children, she has to lose her temper and she has to weep alone in a phone booth. With John, he’s like race horses, only he has more testosterone. We know that John can be volcanic, but to me, this is one of the tenderest moments that I’ve seen John play, along with that. The cast lifted each other in a way that I found remarkable. Randall, since we know the ultimate outcome of the story from history, what was your approach to making the audience really get engaged? WALLACE: When I was a boy, my father was a traveling salesman and he was really successful at it. In fact, I think he was the greatest at it who ever lived because he loved people. He said to me, “People will remember almost nothing of what you say and only just a little more of what you do, but all their lives, they’ll remember the way you made them feel.” That, to me, is the key of what movies are about. A turning point for me, in my career, was when I decided to do stories that made my heart sing. If it didn’t get to my heart, then something was wrong and I either had to not do it or change what I was doing. That is where the game is won or lost. I understand that we had to experience these races as participants and not as observers. That required that we shoot the movie in a way that no horse-racing movie had ever been shot with an approach to filming where you were subjectively in the race. You’re not seeing what it’s like to have watched Secretariat run, but you’re experiencing what it was like to run like Secretariat. There’s a world of difference in that. We also had to understand what it was like for the characters when they’re alone. Some of the most evocative moments in this movie, for me, are when the characters are by themselves. The audiences becomes connected directly to the story because it’s not something we’re showing you, but it’s something you’re living through due to the way we made it. How did you go about casting all of the horses? WALLACE: Horses are a lot easier to cast than people and probably easier to direct. We had a fabulous casting director, who was so fabulous that she put me in Entourage. We had to have the horses be right. Horses have a primordial energy about them, and we got the greatest horse wrangler in the world, Rusty Hendrickson. We knew, first and last, whatever else we did, we had to keep the horses safe and we had to keep the people safe. One of the most crucial decisions that we talked about extensively was using real jockeys to play these characters and not actors pretending to be jockeys. Then, we had to find horses that would capture the energy and brilliance, so we had a Secretariat look-alike contest and the horse that won was absolutely convinced that he was the best looking horse in the whole world. Diane, in the film, Penny has a lot of difficulty balancing motherhood with her career. Were you able to relate to that? LANE: That’s the number one topic in therapy, so you know it’s all going to be your fault, no matter what you do. If you know that going in, then you can pick and choose what you say yes and no to because, either way, you’re always wrong. With that said, and with all good humor, to be a good parent is the most previous and most daunting task that I can imagine, let alone that I know exists. Like horse training, calling forth the greatness of an entity, whether it’s a child or even a race horse, and working within their understanding of themselves and getting them to believe in themselves is a noble task. The jury is out on me, but I sure love my job. I think Penny is very gratified too, in terms of Secretariat being one of her kids. WALLACE: There were moments that were as raw and as deep and as naked, emotionally, as one can be asked to do. Diane had to play a scene in which her father dies and she was there, and we had a scene in which Penny can’t make the play of her daughter. Both of those were one take. We did them, we watched them and we went, “It will never get more real and more powerful than that. That’s all we need.” Certainly, there’s an issue of technique, but you don’t do that unless you know what it feels like and you know what’s real, and she just brought that instantly to the task. Diane, did the hair, make-up and wardrobe help inform this character for you? LANE: We were all so informed by the era and being reminded of it physically was very helpful, as was being on location. If we had been sitting in a backlot in L.A., trying to recreate these spaces and this sky, it wouldn’t have worked. As tactile as we can become, it serves us all. Aside from John, who was making a personal statement, Penny was a woman of her time. She was a beautiful specimen of her time. Maybe she’ll bring it back. I love those shoes with the authentic heel and I had to fight for it sometimes. I’m grateful that it’s as celebrated and respected as it is to be authentic to the time. Randall, what was it like to plan and shoot those racing scenes? WALLACE: The director gets called the filmmaker because so many decision fall squarely on their shoulders. Every great movie, and certainly the only way that I know how to approach movies, is that everybody involved is a filmmaker. They’re all engaged with what’s happening and they’re bringing their talents to making something special. We had our key family gathered around a cork board with push pins, each of them representing a horse, and we had segments of the track laid out. The horses are only allowed to run a quarter-mile in bursts, to prevent the horses from getting so exhausted that it’s dangerous for them to run any further. They love to run. They live for it. But, you can’t push a horse into something that would be dangerous for them, or the jockeys. So, we had the quarter-mile segments laid around for each segment of the track and our cinematographer, who has an incredible crew who works with him, decided on each camera angle that we would use for those. And then, along with that, we had the spontaneity factor. Everybody was so good. These actors are professionals who came so well-prepared. They were prepared like it was with the horses. But, what we wanted to do was be spontaneous. It was nothing for someone to come onto the set and say, “I had an idea last night,” and instead of people rolling their eyes and thinking it was a problem, that was accepted and made everyone excited. The horse-racing, once we started shooting with this tiny consumer camera, we were getting shots of speed and dirt, and excitement and chaos. As soon as we were seeing it, I was like, “I don’t want this million dollar piece of camera equipment that we rented anymore. I want this $800 consumer camera.” We used that for most of the horse-racing. How do you feel about horse-racing and the treatment of the horses? WALLACE: As far as the horses and making the movie, the humane society has mentioned our film as exemplary. We got the highest rating for that. My hope is that our movie will make people have a greater affection for horses. It’s understanding that somebody has a personal face. Race horses are oftentimes not treated particularly well when their racing career is over. I believe our movie is going to help make that a better situation.